First United Methodist Church of Pottstown (414 E. High St.) will be hosting its 4th Coffee House Concert of the year on Sunday, September 15th at 6 pm (after the scheduled Eagles game has ended). 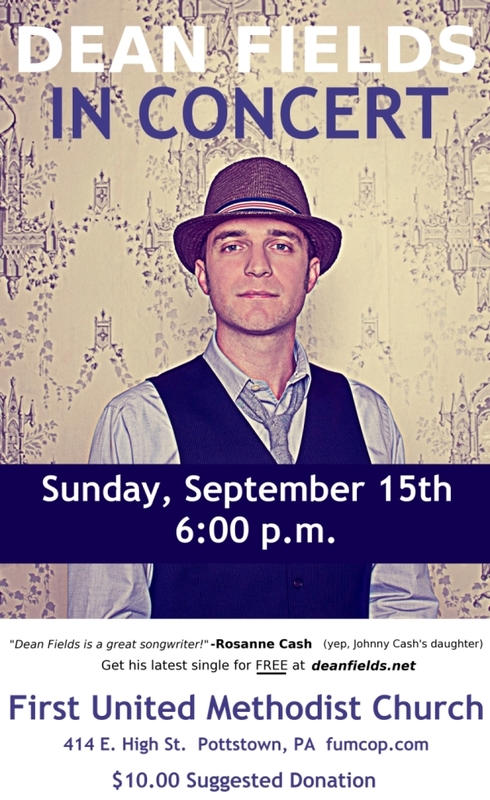 The concert will feature the singer-songwriter Dean Fields. Dean is an incredibly talented musician, with a gift for lyrics and a great voice. You can read more about Dean, listen to some of his music, and download some free songs at his website: http://deanfields.com. Join them for some wonderful music, good coffee, and some tasty desserts! You will learn practical, real-life information on how to start a new business or enhance you current business ideas to make more profits. Workshops will be held at the Pottstown SCORE office, 244 High Street, Suite 102 (New York Plaza).